The obvious result of depression is suicide, but there are those who do not want to go out alone in the misery, so they commit violent acts, including murder and acts of terror before taking their own lives and/or having someone else take their lives. But depression also kills in a more subtle manner that not only has long-lasting effects, but is costly in a couple of ways. Depression takes hostages … can become a lifelong state of living. Depressed people are not just sad … regardless of how good or bad their life may appear to others, depressed people often feel unfulfilled, dissatisfied, and empty. Contrarily, depressed people often feel resentful and angry, acting out their depression with constant judging, complaining, and sarcasm towards others and against themselves. Depression can affect anybody and it does affect people from all walks of life because depression does not discriminate. While appearing quite successful in my early thirties, with a heavy feeling of sadness, frustration, and surprise, I booked an appointment with a psychiatrist because that was the common course of action. Within minutes I was handed a prescription because the doctor said I was clinically depressed, meaning the depression had sunk into my body and my body would need help. Something in the pit of my stomach knew pills were not the answer, so after I walked out of his office door, I threw the prescription in the trash and never looked back. The first person I headed for was my mother, who told me things about my past I had not remembered … surprising, even shocking things that were like pieces of a puzzle clicking into place, making things and me make more sense. I was elated. But not everyone felt the same way. No one wanted to talk about what I needed to talk about. However, my employer offered an employee assistance program providing paid-for services to help their employees stay healthy in all ways and I needed someone to talk with me to help me understand my state of being and how to change it. No quick fixes, but the time spent opened my mind, not only to my buried wounds, but also my buried dreams. Dreams about who I really wanted to be … who I really was underneath the weight of all I had become to look normal, happy, and successful based on people’s expectations. The psychological experience, though daunting, often painful, and even shocking righted the course of my life, well, at least put me on the best path for me. Not everyone was happy. In fact, I lost a lot of friends and family, but they liked who I had become not who I really was. And frankly, they were also very confused as was I. But I was happier than I had been. I did not have all the answers and the journey to fully become the person I knew I could and wanted to be was a rough, rocky road, filled with many detours and pitfalls, but I was developing the ability to respect myself and do as I needed to do, rather than just what other people thought was best for me. The science of psychology, rather than pharmaceuticals, served me well … until I hit the wall. The wall was built out of emotions I was not yet equipped with to handle in a healthy way. You may be familiar with the saying, “If I only knew then what I know now …” I am not sure of the source of the saying, but the truth I am sure has coursed through many minds as people discover the truth wisdom reveals. Reaching beyond science, I turned to the metaphysical world of study looking for a more sound way to deal with the tumultuous sea life is for us all. Up and down round and round our emotions throw us. Shutting down and ignoring emotions, I knew from experience, was not the answer, but just another problem … as was the world and all the horrible things inflicted on people. Meditation and quieting the mind did not work for this very active, creative, problem-solving mind, though I felt the benefits of yoga and my walking meditation. Still, as I grew more into me, I wanted something not yet defined. Then it hit me when I saw a movie titled, “The Longest Spear.” I wanted what one of the lead women had as she stood vulnerable, yet filled with faith and love to bear whatever the consequences may be for being where she was and doing what she was doing. Terrified, she stood her ground peacefully and I watched with wonder and amazement as the true story unfolded. I would like to tell you I achieved her level of peace that day, but I did not because I fought against what it was going to take me to acquire the peace she had and I hungered for. I fought for years. I fought with my logic and practicality. I fought with my rational mind. I fought with my religious scars. But then I gave up the fight because I wanted peace more than anything else. I wanted to be able to go to sleep at night without worry keeping me awake. I wanted to wake up in the morning and be able to embrace the day. I wanted to not be swung around by my emotions caught up in the whirlwinds and tornadoes of life, other people’s dramas, and what is going on in our world. As someone driven to research and learn, going straight to the source I realized was the one avenue I had not yet pursued and it was time I did. Reading the Bible is not easy, especially if we start with the Old Testament, which is all about the times before Jesus came. There was a lot of nasty stuff happening and the good it seemed not so visible. Discovery of what is called an amplified Bible (I bought Joyce Meyer’s Everyday Bible) finally made the Bible more accessible, helping me work with my wounds and angst about abuse and violence in a healthier way so I could read the Bible to soak up the good news. The whole idea of the Bible is that it is a learning device to help us develop a personal relationship with God. And the only way the Bible tells us we can have a personal relationship with God is by going through Jesus. You can believe in God and not believe in Jesus, but why would we choose not to believe in Jesus when believing in Jesus connects us directly with God and provides us with the peace we need to live in this world unafraid, worry-free, respectfully, and lovingly? “Peace I leave with you,” Jesus said. The only price we have to pay is giving up our ego’s misguided idea we have to know and do everything for ourselves, plus the misguided idea life is just misery. When we discover and accept God, Jesus, and the Holy Spirit is on our side we discover the joy and wonder of life. What dies instead of us is depression’s hold on us … this I share with you as my truth with the hope you too will break free of depression’s hold upon you and live as you were meant to live … free to choose what rules us. Thank you Martin Luther King, Jr. for all you were, accomplished, and sacrificed. Like you Martin, I too have a dream … that every person would know by their own experience … they are valued … respected … because everyone matters … because when people know they matter, they create a better world by becoming the best they can be. 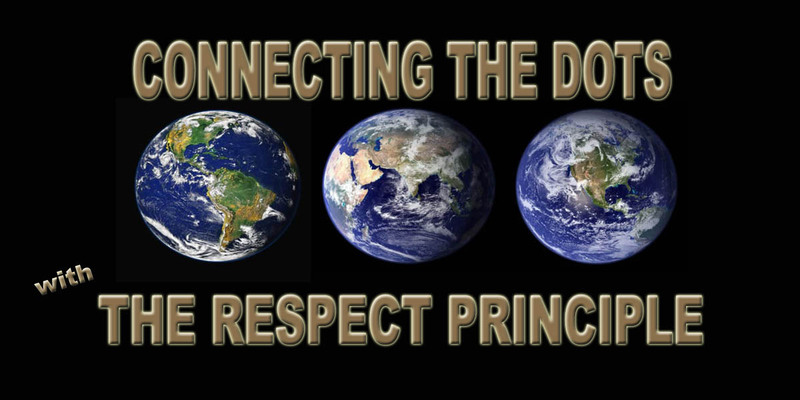 “Connecting the Dots … with the Respect Principle” will help make this happen. KAITLIN ANN TREPANIER … The Respect Specialist. Humanitarian. Social Entrepreneur. Creative. Writer. The company serves as a catalyst to transform “Respect from a value to a principle” as a means to overcome prejudice and its multiple negative results, while fostering peace through the creation, publishing, and production of books, products, and services that educate, entertain, and inspire. Currently a sole proprietorship under my name, the company name will be changing its name to reflect goals and purposes in the new year, plus will be transforming into a partnership and a for-profit social enterprise as the best-fit opportunities arise. “Connecting the Dots … with The Respect Principle” www.therespectprinciple.com © All Rights Reserved 2015. . Ebooks available on Smashwords and other Ebook retailer websites. DARK HORSES … The Short Story That Started It All! Released today on https://www.smashwords.com … the creative short fiction, DARK HORSES, that started it all. What is your vision of freedom … of love? Kaitlin A. Trepanier … The Respect Specialist. Humanitarian. Social Entrepreneur. Speaker. Author. Poet. Playwright. Director. Publisher. NEWSFLASH! EBooks now available at https://www.smashwords.com and other favorite EBook retailers. New release DARK HORSES …The Short Story. Plus, Business Manager search is on! SAVE 50% until TODAY, September 30th on both Connecting the Dots … with The Respect Principle and Dark Horses … A Cautionary Tale. Earn 11% of book sales by becoming a Smashwords Affiliate Marketer! Any one-sided perspective that does not allow other people to choose based on their free will … is not a symbol of freedom, but a symbol of one person or group’s need to have everyone be like them so they feel okay with their beliefs. The most powerful leaders do not lead by fear, but by the strength of their character … their beliefs … their heart … and compassion for those they lead … yet also serve by leading. The “Connecting the Dots … with The RESPECT PRINCIPLE” concept was designed to surpass the barriers of religion, politics, race, etc. because as evidenced by the world, humanity struggles with the concept of valuing … respecting … others who are not in agreement with them, who do not reflect their choices, with believing they have to like or approve of everyone in the world. Valuing … respecting a person or a group of people simply means to live and let live … to be humane .. to help others less fortunate than ourselves … to protect those who cannot protect themselves … to actively engage in the world we live … connecting the dots that reveals the big picture … what we do to others or do not do will impact our own lives somewhere down the line. Based on The Bible, the living word Christians believe in, other than Christmas, and even more so, this is the most important two days of the year … when Christ was crucified on Good Friday and was resurrected on Easter Sunday. If we could grow past our history … if we could at least unite and adopt the one concept, that all life is valuable … worthy of respect … we could obliterate the prejudices that not only separate us and compel some people to harm, imprison, and even kill those who don’t share their beliefs, we could create an economic balance previously unseen and would empower the human race to move past the limitations imposed by prejudices. Making someone wrong through prejudice does not make someone else right … it makes two wrongs. When we are willing to see beyond ourselves, we start to connect the dots and see the bigger picture of the world … and when we start to see our place in the world as someone valuable … entitled to respect for just being a life, we gain the ability to see others the same way … and we see our place in the world as valid and important as everyone else … because regardless of what you have, own, take … we all come into this world in the same way and we go out the same way … with nothing but what is in our hearts and minds. If we do not give other people the freedom and right to choose their own beliefs that do not harm others, then what we have is not freedom … instead we are bound by the prison of prejudice till we free others … and ourselves. Though I was raised a Catholic, for several reasons I rejected the religion at an early ago and studied other religions and philosophies. In fact, so influenced by our culture’s strong reliance, almost religious fanaticism on science and my negative experiences with religion, the “Connecting the Dots … with The RESPECT PRINCIPLE” was developed because of its logic, practicality, and even its dispassionate compassion. Still, I found the concept, like many other religions and philosophies, did not satisfy a deeper yearning inside of me … the more profound that seeks deeper answers … so in the past few years I returned to Christianity by studying The Bible for myself and surprises abounded … especially surprises that generated freedom from judging and condemning others, peace, hope, and more positive feelings than I have ever experienced in my lifetime. I share this because I know from experience how both concepts, one scientific and philosophical and the other spiritual, not religious, are transforming me from being a hurt, frustrated, depressed, fearful, and angry woman into a healed, whole, more peaceful, and if not always loving, at least a respectful woman … who values other people and their differences and who works to find ways to bring more peace to the world, to encourage the ongoing development of potential, and to help us all connect to co-create a better world for each and every person … because both concepts have taught me everyone comes into this world with unique gifts, talents, and abilities intended to contribute to good of the whole … if we show them how by example and by our support. Getting into a relationship is easy because most of us want the dream of the relationship being “The” relationship of our lifetime … that will last a lifetime. But unfortunately, desire for “The” relationship clouds our best judgment and what should have been “The” relationship results instead in yet another learning experience … one difficult to walk away from, especially if we have grown accustomed to a lifestyle the combined finances generated. Separation is the acknowledgement change needs to happen, yet with a separation hope remains; however, with the receipt of the divorce papers, the finality sinks in, along with having to deal with the financial ramifications … the “who gets what” scenario many dread … even if we know the change really is the best decision. But what if you were forced into a relationship you did not want to have? What if your country was overtaken by another? Another who used violence to take what belonged to you? And what if over time, you still desired your freedom, but did not want violence to be the catalyst of change? What if you desperately wanted out of a relationship you never wanted or asked for … even if over time you were treated decently? Would you still feel like a prisoner … a slave to another person’s desires versus yours? If so, what would the answer be? One person walking away from another, even with children involved, is one thing and challenging enough to emotions, minds, and finances … so what about a portion of country’s citizens who want a divorce but are denied because the majority rules? Even if that majority is only a small percentage higher than those who want the divorce? If democracy is about freedom, does that freedom not apply to all people in a country? And if the country is built on the premise of freedom, then isn’t it the country’s responsibility to figure out the details of the country’s separation so eventually enough of the details will be resolved, by people with high enough Respect Levels, who know that keeping people from their freedom of choice and punishing them for their choice is counterproductive to their nation’s welfare, in order for both parties to go their own ways and build new lives … and nations with people who want to be where they are? Twice divorced, once from a marriage less than a month after turning sixteen (not pregnant … just running from situations I did not know how to deal with effectively) and once from a marriage of nineteen years after my true self started to emerge, which replaced the chameleon I had become to try to be what people wanted to be accepted, liked and even loved, I know from experience of what I write. What compelled me to leave both was my desire for freedom … but not freedom to be wild and unrestrained … but freedom to discover who I really was … and to be who I really was and to be with people who valued … respected me for me. The quest achieved many years later, freedom is a gift I longed for my whole life and now I know how to be me, I can once again consider marriage again because this time I will go into the marriage as me … and my husband will know at the beginning who I am and he will think I am cool and will not desire to change or restrain me by his beliefs … and nor will I him. Inspired by the week’s events, I write this in the wake of Scotland’s referendum … 55% wanted to stay … 45% wanted out of a relationship they never had a choice about. There was no victory because victory is not victory if it is about oppressing people. Instead the numbers reveal much work has yet to be done in raising Respect Levels in the nation, just like Canada has to with regards to its province of Quebec citizens, who desire their freedom also, and other countries too around the world who desire to be freed from the various kinds and levels of oppression. Democracy has to grow with the awareness that keeping people prisoners, no matter how kindly, is still preventing freedom. And countries filled with discontent, need to work on the plans of how to fairly split the nation and resources. Not a quick fix, but a process that will in time, free those held prisoner, even if only in their hearts and minds, yet will also free the oppressors from roles and responsibilities that have become unnecessary and obsolete, plus foster discord and strife. Of course, as with any divorce, especially when children are involved, people have to learn to accept change is inevitable and what has come to pass is often not about them, but about everybody … and everyone has to work together to create something new out of something old … being hurt, resentful, angry, and even vengeful will only make the pain worse, plus will cloud judgment on how to best move forward for all people’s sake. Living is all about change. Change will happen regardless of how much we fight to keep things the same and history proves the more we try to keep people imprisoned, in any way, at some point they will more than just disagree … they will fight for what they believe is right … their freedom to choose. A higher level Respect Level world will recognize this natural progression and will develop ways to adapt to the pressing changes … including shifting borders and signing divorce papers of a once unified nation.